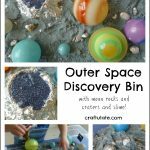 This art project was inspired by our Outer Space Discovery Bin – in fact we did this straight after F had finished playing with it! I also used some tape to secure the card to the table. 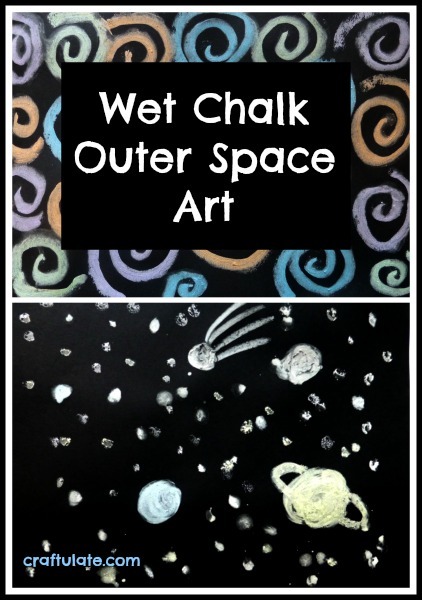 We placed the chalks into the container of water until the tips had softened, and started creating our outer space art. The wet chalk makes the colours super vibrant against the black card. F made a big planet and lots of stars. I think he also tried to draw a ring around the planet like Saturn. I tried this art technique too! I’m not much of an artist but it was fun to try. Afterwards he wanted to try it again but more freestyle, with different colours, so we each created another piece of art – it really showed off the bright chalk! Note: The chalks were a little damp after this activity but I left them to dry on a paper towel overnight and they were fine by the morning! 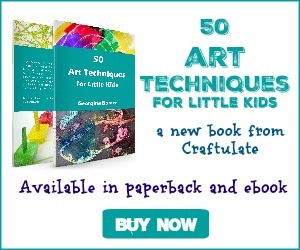 What kind of artwork would you and your kids make with this technique? Awesome, just what I needed to combine making a birthday card with space theme and exploring new techniques with my toddler. Thanks!